Material Composition : Polyester Blend, provides an elegant look and silky soft to the touch. Allows natural light to flow through the room. Instantly update your home decor with this gradual change color sheer curtain panels. Process Type: Rod Pocket Top. Easy to install,no other tools needed. Care Instructions: Due to soft and crafted nature, please wash lightly, hang to dry, low iron . 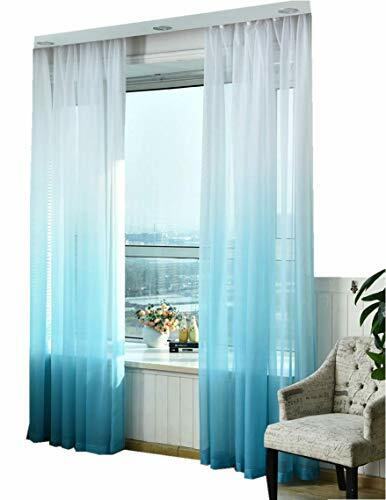 Decoration Effect: Transparent Voile curtains just like a gentle breeze flow into your rooms, which can bring you more comfort. This gradual change color is really main highlight, creating more fantasy feelings and shining your house. GOOD NEWS!!! we can also offer size customized service, just tell us the specific size you need. So, NO HESITATE to get one or more please.